‘Carp’ refers to a number of species in the Cyprinidae family. They are mostly larger fish, and they live in freshwater. Carp can be found on virtually all continents since being imported from Asia and Europe. The United States introduced carp to their waters in 1877 in order to boost food security. The most common types of carp include the Common Carp, Silver Carp, Bighead Carp, Grass Carp, Catla Carp, Crucian Carp, Black Carp, Mrigal Carp and lastly the Mud Carp. In a period of one year, a female carp produces close to one million eggs. These eggs are, however, vulnerable to predators, bacteria, and fungi, so don’t be surprised at their relatively low populations. Being native to Europe and Asia, some countries have found carp to be an invasive species. They have the capability of spreading to a degree deemed harmful to the environment. More specifically, they promote rapid algae growth by excreting partially digested food. Carps are not largely popular with outdoor sportsmen. They are mostly caught as game fish. Their diet is largely similar across all these species. Carp mainly eat aquatic plants and insects. They are bottom feeders. Carp normally hang out at the bottom of the lake to search for aquatic vertebrates such as crayfish and zebra mussels. Carp can grow up to 6 pounds a year if they have an abundant food source. 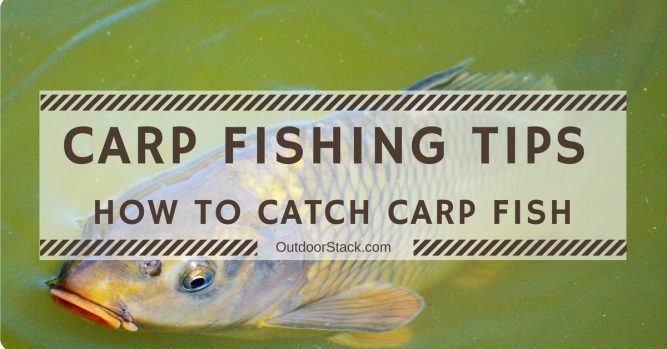 You must know where to look for carp, so as to increase your chances of catching your very first one. Carp prefer still water. They can however also be found in canal systems and rivers. The ideal area will be filled with vegetation. Carp hang around such plants as they feed on them, as well as on insects and other animals that feed on these plants. On hot sunny days, look for carp in shallow water. During cold weather, they’ll be hanging around in the deeper water. As I said before, carp prefer still water. You will, therefore, want to look for them in areas of slow moving water or standing water. This usually means freshwater lakes, rivers or ponds. It is said that carp expend more energy in rivers with stronger currents. This causes them to feed more frequently in order to keep up with the energy needs. They will, therefore, hang around areas with a consistent food supply. This can be either the inlet or outlet of the lake. Carp, like other fish, prefer places where there is some kind of structure that provides protection. These may include overhanging tree branches, submerged logs or weed patches. You may consider a small gap in between two bushes. Another spot not to miss is anywhere you have duck or geese. Carp normally follow ducks so as to have a share of what they are being fed by humans. They will gladly snack on some bread meal being fed to the ducks. Time-wise, the best would be early morning or late evening, when the fish come out to feed. You can catch carp any time of the year, though their behavior changes slightly with the season. Carp are known to be most active during summer. Carp are incredibly strong fighters and very intelligent. They are known to be the most line-shy of all fish. Your choice of equipment should, therefore, match the weight and fight of the fish. One thing you should note about carp is their heavyweight. They grow up to an average of 27 kg. This tells you that a normal rod for bass or trout fishing may not work since these are usually made of graphite and may shatter under the weight of the carp. Instead choose a composite, e-glass or carbon fiber rod which can adequately tolerate the weight. The most preferable is a solid fly rod 4-6 pounds in weight. This will be strong enough to fight a big carp. In choosing the rod, also consider the type of water you will be frequenting. You can start with a medium action rod about 3.5 m in length. Carp are mainly caught through still fishing, either with bottom rigs or sliding floats. They are known to get extremely spooked once they get hooked. This is followed by an incredibly powerful run that may make you lose your rod if your drag is too tight. You should choose a reel in the 40’s, 50’s or 60’s series that has a dual drag system (i.e. the standard drag system and a baitrunner drag setting). The carp fishing line should be of high quality. Carp require less drag resistance compared to other fish. A super-braid or copolymer line will serve you well. You may also want to try a 40-foot monofilament shock leader which will give the line some stretch. Carp fishing hooks should be smaller than #10 size. They should also be sharp and sticky. Carp are known to nibble at the bait before taking the whole of it in their mouth. They are able to see big hooks, so they avoid them for fear of their lives. You can purchase barbed hooks which are able to keep the fish on the line. Scale – for weighing your carp. You never know when or if you may catch a record size carp. Miscellaneous items such as folding chairs, camera, sunscreen, food, drinks, etc. all geared towards improving your comfort on the lake shore or river bank. Once you have the right equipment at hand, your arsenal will not be complete without the correct bait. Let us see what type of bait works best for carp fishing, and which baits to avoid. The best bait to start with is corn. Carp like the color, texture, and flavor of corn. They prefer sweet corn out of the can to corn off a cob. This is because of the flavors and additives found in canned corn which includes sugars, salts, and critical amino acids. The bright color of the corn is also a good attractor to carp. The next bait to consider is boilies. These are fishing baits made of milk proteins, fish proteins, grains, and eggs. They serve as a good alternative to the corn. Also, consider artificial lures. Note that carp are not an easy fish to catch on artificials. You should know how to work your artificial lure. Try small lures that look like a small bug or worm, made of soft plastic. Attach the artificial lures to a heavy jig head and move it up and down near the bottom of the lake or river. Generally, carp are opportunistic feeders. They get accustomed to almost any food source, especially those designed for human consumption. You can, therefore, try other junk foods like bread, chips, crackers, fries, hemp, tiger nuts or popcorn. Small fruits like cherry tomatoes and chickpeas are also a fine choice. Remember to check the regulations on bait for your state. Some bait may be banned for reasons best known to the state. Now you are ready to cast your line. The first thing you should note is that carp get scared quite easily. Do not cast directly on top of a school of carp feeding. Instead, cast slightly ahead of them in the current, so they swim onto it whilst they are feeding. Attach your weights close enough to the float to enable you to cast the line with ease. Once you have cast the line, sit back and carefully watch your float. Remember that carp are intelligent fish and may not take the whole bait at once. In fact, they may even eat around your hook and finish the entire bait without being hooked. You will, therefore, have to exercise a bit of patience and skill to make your first catch. Keep a constant eye on the float. If you notice it bobbing up and down, this may be a sign that a carp is around your bait. If the float is quickly submerged, the carp is probably hooked. But, if the float lifts out of the water, you know that the carp is intelligently eating around your bait. In this case, immediately lift the float out of the water, jerk back your arm in a quick steady motion to secure the hook into the mouth of the fish. This is achieved by holding the fishing rod tightly and pulling it smoothly in an upward direction. Start reeling in if you feel the weight of the fish on the end of the line. You won’t always hook the carp using this method, so be ready to make a number of attempts. If you have hooked the carp, do not get it out of the water immediately. First, let it tire itself out. You can do this by pulling the fish downstream. This makes it fight the current as it struggles to swim upstream. The result is a tired fish, which will be easier to get out of the water. Do not use your bare hands to lift the carp out of the water. Make sure you have a net for grabbing the carp. Place this net under the carp. Put one hand under the belly and the other on the tail. Wearing gloves will save you from being cut by the fins. The carp may still put in its last fight once it’s out of the water. Hold them firmly to avoid losing your catch. You may want to cover the eyes with a wet dark cloth as you remove the hook. A good way to start carp fishing is to start with a chumming campaign. Once you identify a prolific fishing spot for carp, throw in about 1 kg of the bait you intend to be fishing with. Do this for about 4 or 5 days, around the same time each day. You may keep it constant at 16.00 every evening. On D-day, return to the same spot, this time with some bait on your line. You can imagine how many carp you will be able to catch! Once the carp find that spot with a reliable food source, they are most likely to return to feed. Consider using an electronic bite indicator. Once a carp is hooked, it gets spooked and darts away at high speed. This bends your rod almost in half, and in your panic rush of adrenaline may cause you to break your rod or line. The electronic bite indicator will save you. You should also have a minimum of 300 feet line on your spool, with a looser drag setting than that used for other fish. You will notice that carp will often take cover in rock piles, logs or weed beds. A rod specifically for carp fishing may not help you fight the fish once it hides in such places. It is then your line that becomes vital. In summary, carp fishing requires you to first understand their behavior and habitat. The next step is to find the right equipment and bait for catching carp. Finally, employ the right technique of casting and you will be sure to make a catch. We hope it has been a great read so far. Did you find the guide useful? Did you enjoy reading the carp fishing tips and tricks? Please share your feelings in the comment section below.